An editorial in last week’s (19 Jan) New Scientist magazine claims that “there is a case for nuclear power, but the future is with renewables”. Gone are the days of scientific optimism. The new scientists are now pessimists. The editorial concludes, following some seemingly intractable political problems with nuclear energy that “… don’t let’s delude ourselves that [nuclear power] still has a long-term role to play”. This miserable theme is continued on page 38 by David Strahan in his article The Great Coal Hole (available in full here), in which he reports that the world is facing an imminent shortage of coal. “And not only because of logistics”, warns Strahan, “but also because of geology”. This runs counter to many previously held studies which have attempted to estimate how much black stuff we have left. One 1996 study even suggested that there may be as much as 7.8E12 tonnes (7,800,000,000,000) of coal – enough for around 1200 years at today’s rate of consumption. According to the article, however, even the World Energy Council’s far more conservative 2007 estimate of 847 billion tonnes of known coal reserves world-wide (enough for 140 years at present consumption) may be vastly over-inflated. Known reserves of economically recoverable coal are actually shrinking faster than coal is being consumed, says Strahan. Another less noticed reason is that in recent years many countries have revised their official coal reserves downwards, in some cases massively, and often by far more than had been mined since the previous assessment. For instance, the UK and Germany have cut their reserves by more than 90 per cent and Poland by 50 per cent … Figures for two of the world’s biggest coal producers are particularly hard to glean. Russia has failed to update its numbers since 1996, China since 1990. “There is really nothing very certain or clear-cut about reserves figures anywhere,” Clarke says. Even senior officials in the coal industry admit that the figures are unreliable. “We don’t have good reserves numbers in the coal business,” says David Brewer of CoalPro, the UK mine owners’ association. A more sobre analysis of Britain’s coal situation, from 1993, is available from the New Scientist’s own archive. It reveals that the true size of the UK’s coal reserves has never been certain. The nature of the real problem is well illustrated by the deceptively simple question of ‘How much coal is there in Britain?’ A great variety of answers has been provided over the years. A report of a Royal Commission in 1871 estimated the figure to be 149 billion tonnes. Reserve figures based on coal workable for the following hundred years were estimated in 1942 at 21 billion tonnes. In 1973, ‘operating reserves’ were estimated at 4 billion tonnes and in 1979 to be about 7 billion tonnes. Also in 1979, British Coal estimated ‘coal in place’ at 190 billion tonnes, of which about 45 billion tonnes might eventually be shown to be a reserve, a figure that has been taken to indicate that there is enough coal for the next 300 years at the prevailing rate of mining. Recently the British Geological Survey has suggested that the true operating reserves may be as little as 3 billion tonnes. So, over the years we have seen an extraordinary range of figures for Britain’s coal reserve/resource. Evidence from the Coal Authority to a 2001 House of Lords Select committee suggested that the UK had even less coal. The CA has consulted with the British coal industry and have advised the Cabinet Office Energy Review that estimated established reserves amount to 222 million tonnes with a further known potential of 380 million tonnes; in addition currently un-accessed deep mine and open cast resources potentially (see para 11 below) provide many years of future production at present levels. Section 5(6)(b) of the Coal Industry Act 1994 specifically prevents the CA from exploring for new coal or proving known occurrences. It is also barred from obtaining planning permission or any other authorisations required for carrying on coal mining operations. In today’s circumstances, this prevents an overall approach being adopted in the public interest. Equally important, known reserves of coal are universally in danger of being sterilised by non coal related surface developments. There is little, if any, effective planning policy to prevent the sterilisation of coal which may be required for working in the future. Unlike the situation with aggregates for example, there is no land banking policy for opencast coal embedded in the formalities of the Town and Country Planning system. Even if Britain’s considerable opencast and deep mine coal resources are not to be extensively worked under the existing planning regime, it is important that they should be kept available to facilitate any future change in policy which might favour their exploitation. Taken together, dramatic falls in some countries’ reserves coupled with the stubborn refusal of others to revise their figures down in the face of massive production suggest that figures for global coal reserves figures are not to be relied on. Is it possible that the sturdy pit prop of unlimited coal is actually a flimsy stick? This seems to imply that something nefarious is going on. This “stubborn refusal” is presented as though it were a deliberate attempt to deceive, when in fact, as is clear, the truth is that there are no such data, even for the UK. How can we expect it to exist in Russia, and China, given their comparatively vast sizes, and arguably more limited human resources? The article goes on to explain that we know that coal is running out – in geological terms – in spite of the conspiracy to keep us misinformed, because price increases would have the effect of increasing known reserves, as geological reserves became economically viable. we have reached, or are just about to reach, peak oil – the point at which oil production hits an all time high then goes into terminal decline. That is to say that we know that prices have risen, and reported reserves have fallen, indicating that prices are rising because of depletion, not confounding economic factors. But Strahan has already explained that reserve reporting is unreliable. Now that they are being downgraded, he seems sufficiently confident in them to make some alarmist statements. Yet we know that the downgrading of reserves has political causes. For example, one reason for the UK downsizing its reserves might just be because of Britain’s recent history. Coal mines in the UK were shut down amid a historic dispute between the Government and miners, and the declining cost of importing coal from elsewhere against the rising costs of domestic production, not because Britain had run out of coal. In the case of oil, the rising price has much to do with uncertainties caused post-9/11 and by the War in Iraq and tensions in the Middle East. Reluctance to invest in exploiting new reserves might reflect the fact that global economic forecasts are currently as gloomy as the New Scientist. With economic downturn comes a reduction in demand. Who would invest in bringing new sources online in the face of economic uncertainty? Furthermore, it is not true that known geological reserves can switch on and off according to the price. Mining is an expensive business, even more so when mistakes are made. But recent years have seen the opposite trend, with a progressive decrease in the price of most fossil fuels. Variations in the price of a barrel of oil have resulted in oilfields being brought into production or ‘mothballed’ as the price has gone up, or down. In the short term, price variations of a commodity have little to do with available resources or reserves and everything to do with Gulf crises, new environmental legislation, the state of the economy or perceptions within the commodity market. In the longer term, however, the price must be related to the availability of resources and reserves and the ease and relative potential cost of transferring estimates from the resource category to the reserve category. To forecast coal production Rutledge borrowed a statistical technique developed for oil forecasting known as Hubbert linearisation. M. King Hubbert, after whom the method is named, was a the Shell geologist who founded the peak oil school of thought. In 1956 Hubbert famously predicted that US oil production would peak within 15 years and go into terminal decline. He was vindicated in 1970. … it appears that there exist within minable depths in the United States rocks with uranium contents equivalent to 1000 barrels or more of oil per metric ton, whose total energy content is probably several hundred times that of all the fossil fuels combined. The same appears to be true of many other parts of the world. Consequently, the world appears to be on the threshold of an era which in terms of energy consumption will be at least an order of magnitude greater than that made possible by the fossil fuels. Hurrah for not having enough energy. Yesterday, we had a bit of a go at a philosopher for his naughty, anti-democratic (if unconsciously so) world view when it comes to saving the planet. Well, it turns out that Marc D. Davidson ain’t got nothing on David Shearman and Joseph Wayne Smith. You don’t need a Rorschach test to tell where they’re coming from. They’ve written a book called The Climate Change Challenge and the Failure of Democracy. Roger Pielke Jr nails it. Davidson claims that historical hindsight shows how preposterous the claims made in favour of slavery were. He suggests they bear striking resemblance to claims made against taking any action on climate change by contemporary members of Congress. Political decisions are based on money, not morals. It’s that money argument, again, even though abolition is about as good an example of a political decision based on morality rather than money that you are likely to find. Brahic’s sympathy for Davidson’s thesis appears to be based on the idea that arguments for the continuation of slavery were preposterous, and business-as-usual arguments are preposterous, therefore, denying climate change is as bad as being in favour of slavery. Or something. Today, the United States is as dependent on fossil fuels for its patterns of consumption and production as its South was on slavery in the mid-nineteenth century. That US congressmen tend to rationalise fossil fuel use despite climate risks to future generations just as Southern congressmen rationalised slavery despite ideals of equality is perhaps unsurprising, then. This article explores similarities between the rationalisation of slavery in the abolition debates and the rationalisation of ongoing emissions of greenhouse gases in the US congressional debates on the Kyoto Protocol. But how is using slaves the moral equivalent of using oil? The subtitle of the second section of Davidson’s article – ‘Similarities between slavery and the use of fossil fuels’ – promises to answer the question… but doesn’t. Instead Davidson argues that they are similar because (i) abolition of slavery/oil is not in the interests of the electorate – people who had a vote did not have an economic interest in abolishing slavery, or in the later case, oil; (ii) the electorate shifts costs onto those outside of the electorate – the slaves do all the work in the same way that oil does, and the costs of using that oil (as opposed to labour) are borne by future generations, who are not yet part of the electorate; and (iii) arguments against both the slave trade, and efforts to reduce CO2 are similar because they both resist social change. Davidson’s problem, it seems, is with democracy – that it does not represent the interests of people who do not yet exist; people in the future are excluded from the process because they aren’t alive yet, just as slaves were denied access to the democratic process. But this does not make equivalents of using slaves and using oil. In order to be deprived of ‘rights’ it is necessary to exist. So to grant rights to people who do not exist, or to claim that they are being denied their rights, or to imply that you somehow speak for them are all totally absurd. And it’s far from clear that using oil does leave a cost for future generations to pay. This claim cannot be tested until such time as such people exist. It is a significant assumption. Davidson defers the argument to the future, in order to escape being challenged. And he admits that reducing CO2 emissions is not without its detrimental effects: after all, he agrees that it’s not in the electorate’s interests. It is democracy itself which creates slaves out of the humans of the future, according to Davidson; democracy is the means by which social progress is thwarted; it cannot transcend self-interest in favour of the interests of people he has conjured from his imagination. The “social progress” (and it is neither) he has in mind (even though he agrees it’s not in people’s interests) is one where people who don’t exist yet are spoken for by anyone who wants to call the precautionary principle, against the interests of people who actually exist. More interestingly, especially given that he’s a philosopher, Davidson doesn’t even explain why slavery is wrong. Slavery is wrong, of course. But if you want to show that something else is wrong in a similar way, you have to make it clear why it is wrong. Were we to claim that tap-dancing is the moral equivalent of drug-pushing you’d want to know why. If we answered in terms that failed to connect tap-dancing to drug-pushing, you’d close your browser, never to return. Phillis Wheatley was a slave from Gambia bought by a wealthy Boston Family at the age of just seven in the mid 1700s. Unusually, the family encouraged her to read and write, especially poetry – for which she became famous on merit. You don’t need to be a Christian to see the message. Wheatley was grateful for being brought to the USA, and for the opportunities she had, but not for being bought and sold as a slave. This is pertinent because no barrel of oil could ever write a poem which expresses such potential. As her poem suggests, the act of buying, selling, or using slaves is immoral because it creates a relationship between people which degrades humanity, when in fact, slaves were in every respect as capable of achieving as much and contributing to civilisation as their white counterparts. The trouble for Davidson is that were he to state a principled objection to slavery, he would undermine his own argument. It would fall apart because, of course, people are not oil. It is only by dint of similarities in the shape of certain arguments, without historical and political context, superficially sharing some conceptual space, that slavery and oil usage can be seen as moral equivalents. Morality, for Davidson is more like geometry than an expression of humanity. This reveals far more than any resemblance between arguments against abolition and against climate change mitigation. Davidson goes on to look for more geometrical congruence between arguments made hundreds of years apart, and finds another six arguments used by both Kyoto sceptics and anti-abolitionists: (i) What is deemed bad is in fact good; (ii) The benefits of the proposed policy are uncertain; (iii) Change brings economic ruin; (iv) Solo action will be ineffective and unfair; (v) Sovereignty will be undermined; (vi) Social change will hit other groups. This is utterly mundane. What political issue is not debated on these lines? What divides camps on any matter, where one sees a thing as a good, and the other bad, with one arguing for either progressive or retrogressive change, the other for the status quo? Davidson might just as well argue that using oil and using slaves are moral equivalents because arguments in favour of their continuation were both constructed using words and marks of punctuation, arranged into sentences. What he is describing are six questions that will likely be at the centre of any political discussion about change. The closer you look at these six points, the sillier they become. In fact we are starting to seriously wonder whether his paper is some sort of clever spoof. “Thus far, no one has seriously demonstrated any scientific proof that increased global temperatures would lead to the catastrophic predictions by alarmists. In fact, it appears just the opposite is true, that increases in global temperature have beneficial effect on how we live our lives.” – Sen. James Inhofe. We know why slavery is wrong. It deprives individuals of their liberty, and the institution limits the development of human society. Meanwhile, Inhofe’s point finds support among among many mainstream climate scientists, such as the Tyndall Centre’s Professor Mike Hulme, who has observed that catastrophe “is not the language of science“. And the idea that climate change might produce benefits – however true or false it is – is not a moral argument. By contrast, the ideas that slavery is either right and good or wrong and bad are not testable, are moral arguments, and more to the point, slavery is an idea which disgusts us today not because of scientific investigation, but because of our understanding of humanity. Yet Davidson uses scientific and moral arguments as though they were interchangable. (ii) The benefits of any proposed policy are always uncertain to any opponent. How can somebody who doesn’t see the policy as good, ever see the benefits as certain? (iii) No doubt the end of slavery did bring economic problems, and yes, sceptics do worry about the economic costs of policies to mitigate climate change. But anyone who cites the Stern report in support of immediate mitigation also makes an economic argument. Does that make them the moral equivalent of slave traders, too? And even Davidson agrees that the economic effects of Kyoto would cause economic problems. Although economic forecasts vary widely, there are few studies predicting that climate policy will benefit employment or economic growth. (iv) It is precisely the environmentalists who are arguing that solo action will be ineffective and unfair. That is why they – and Davidson – are calling for international frameworks. (v) Sovereignty is not only a key concept in most political theories, it was also at the heart of the abolitionist argument, for slavery denies personal sovereignty. Davidson contrasts the argument that it is for individual states to decide the legal status of slavery in the 1800s with more recent complaints about supranational organisations (IPCC) creating policy frameworks. As sincere as this fear of supranational bodies may be, however, the arguments become suspect if they are not accompanied by proposals for unilateral action. And yet he’s already claimed that the “solo action will be ineffective and unfair” argument is “reactionary”! Only, it seems, if it doesn’t conform to climate orthodoxy. Again, Davidson’s contempt for democracy is palpable. Apart from specific groups like manufacturers of solar cells or windmills, few people have a personal interest in rising energy prices. For Davidson, Kyoto sceptics are “reactionaries”, but it is Davidson who shows contempt for democracy, and for politics. He is unable to make moral equivalents of slavery and using oil, and so searches for abstract ways to connect them that bear no scrutiny. In doing so, he also shows contempt for humans. The relationship between slave and master is vicious, exploitative, and deliberate. The link between slaves and not-yet-existing-slave-like-people-of-the-future is merely tortured. The only person deliberately exploiting future generations is Davidson. The irony is that it is people in the present who suffer. Climate Debate Daily is intended to deepen our understanding of disputes over climate change and the human contribution to it. The site links to scientific articles, news stories, economic studies, polemics, historical articles, PR releases, editorials, feature commentaries, and blog entries. 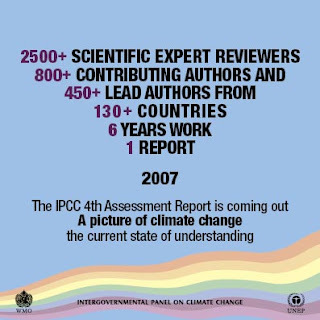 The main column on the left includes arguments and evidence generally in support of the IPCC position on the reality of significant anthropogenic global warming. The right-hand column includes material skeptical of the IPCC position and the notion that anthropogenic global warming represents a genuine threat to humanity. While we welcome such a high profile effort to promote discussion of climate change issues – and there’s certainly a lot of great material up on the site already – we are not entirely convinced about their binary, for-and-against approach to the subject. One of our main quibbles with the way the climate change debate is presented is precisely that the IPCC “consensus” belies a broad range of nuanced positions and arguments – both scientific and political – as does the so-called sceptic camp. Given Dutton and Campbell’s mission statement, one wonders in what column they’d put an article arguing, for example, that climate change is real and anthropogenic (à la IPCC WGI), but that efforts to mitigate are misguided (contrary to WGII and III). Time will no doubt tell. If this climate chaos carries on, the weather the day after tomorrow will be the same as it was yesterday. Again. Thus proving once and for all that climate change is real, and is happening, and something must be done about it. 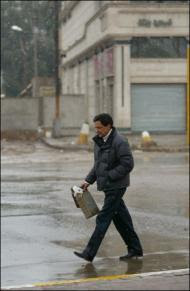 An Iraqi man fearlessly battling against the light snow and mild breeze yesterday.